With the Shoppable Instagram app yout can turn your Instagram profile into an online store and your Instagram followers into customers. The Shoppable Instagram is divided into two options: Product upload via Instagram and Comment Selling. In order to use the app first of all you will need to connect your Instagram account with your Soldigo store. 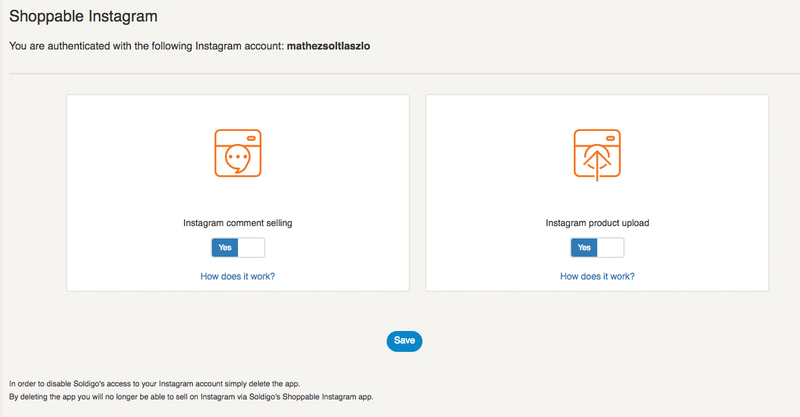 You can do this by login in into your Instagram account. After that you will have to activate the options of the app by switching the “Yes-No” option to “Yes”. Upload your products to your Soldigo store directly from your Instagram account. It’s easy and you can use the Instagram filters to create stunning image about your products. Beside the #usesoldigo hashtag add a price tag: #price:X and the product title tag as well: #title:the-product-title when you share the photo using your Instagram app on your smartphone (for example: #title:the red squared tie). Log in to your Soldigo Dashboard and your product is uploaded. Feel free to add more details of the product. Your followers can buy your products directly from your Instagram profile by commenting on your photos. Beside the #usesoldigo hashtag add a price tag: #price:X and the product title tag as well: #title:the-product-title when you share the photo using your Instagram app on your smartphone. In a post comment ask your followers to comment with their email addresses to buy a product. Your followers will comment with the #wantit hashtag and their email addresses to buy the product. Your followers will receive a secure checkout link right to their email inboxes to finish the transaction. This entry was posted in Apps, Sales Channels on April 9, 2018 by shoptsieblogadmin.